We are now in the income phase of portfolio management, partially (or totally) withdrawing each month from the available settled cash from earned dividends *only* (leaving all positions and principal untouched, except for trading activity)! 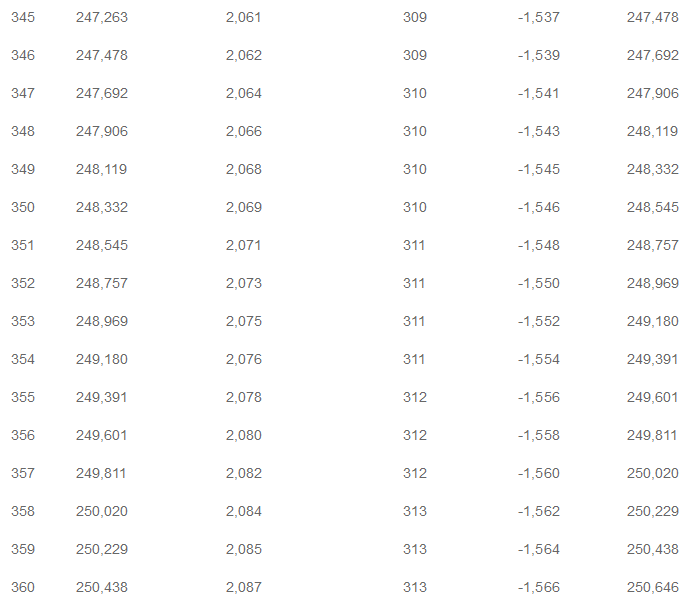 Shares being DRIPped (besides the 13 positions noted below) are shown on the Google sheets on the Dividends tab. As of September 27th; FFC, FLC, GOF, GUT, MAV, MHI, PFD, PFO, PHK, PHT, PMF, PML, & PMX will be DRIPped in Fidelity accounts because they reinvest at a discount! I just love a bargain! Part (or ALL) of the cash in our accounts will be withdrawn each month on an ‘as needed’ basis. 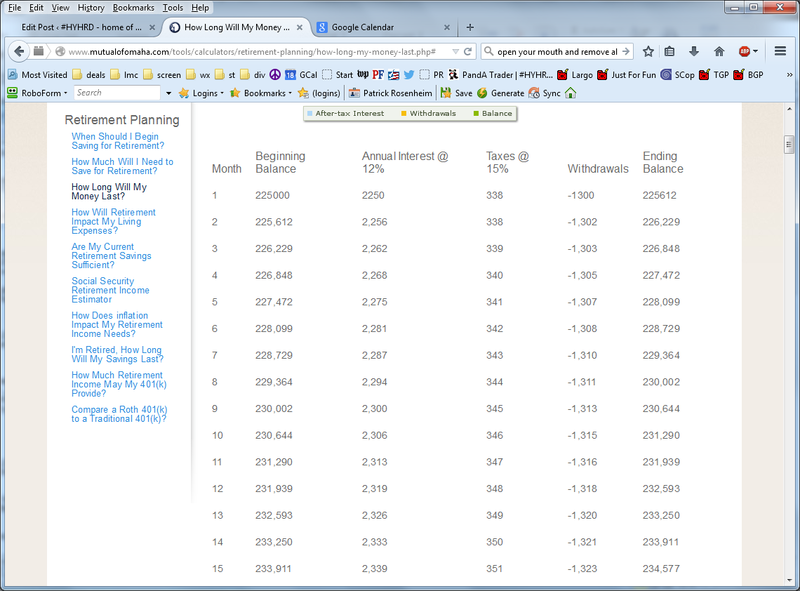 The available withdrawal amounts are shown on the Expected Dividends Part 3 spreadsheet. Projected checkbook balance for the end of the current month should now be at least $5,000.00 – $10,000.00 but if it’s not within that range then the dividend reinvestment and withdrawals will need to be adjusted. Also, the next few month’s projected EOM balance will also be used to determine if adjustments are necessary. This will provide a greater ‘margin of safety’ and hopefully avoid any unpleasantness. I think planning up to 3 or 4 months in advance should provide a reasonable level of financial security, all things considered. Monthly withdrawals from available (i.e. ; settled) cash will be taken. Monthly withdrawals are subject to a minimum withdrawal of $10.00 (imposed by Fidelity, no limit is imposed by the joint account). In case our checkbook balance exceeds above limits, then a deposit to one of our joint accounts will be made instead. In this case, of course that also means there would be no withdrawals that month. Monthly withdrawals will only be scheduled on the first of each month or on an ‘as-needed’ basis. Starting 9/1/15, the taxable account is the only account making additional investments exclusive of dividend reinvestment. On 11/29/16, I stopped DRIPping all positions in order to help accumulate cash for Tax Day on 4/18/16. DRIP will begin to return 4/19/17. In our ind-PandA account, I will withdraw $1,700.00 from the account. There is no tax withholding in this taxable account. In our PandAjoint account, I will withdraw $0.00 from the account. There is no tax withholding in this taxable account. 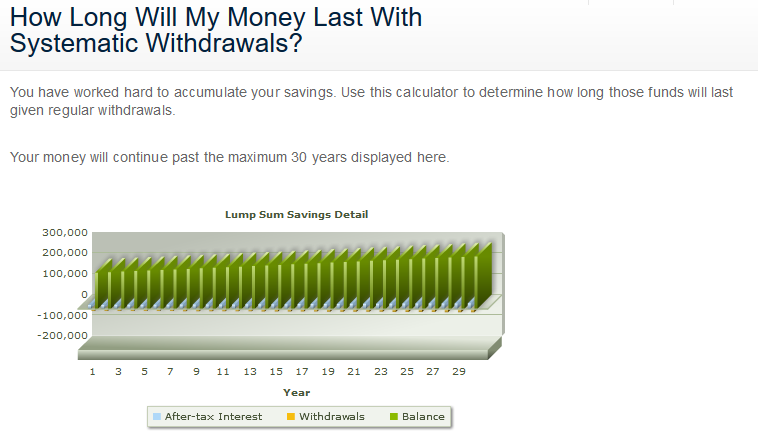 In my IRA-P account, I will withdraw $0.00 for a net deposit of $0.00 after 25% tax withholding. 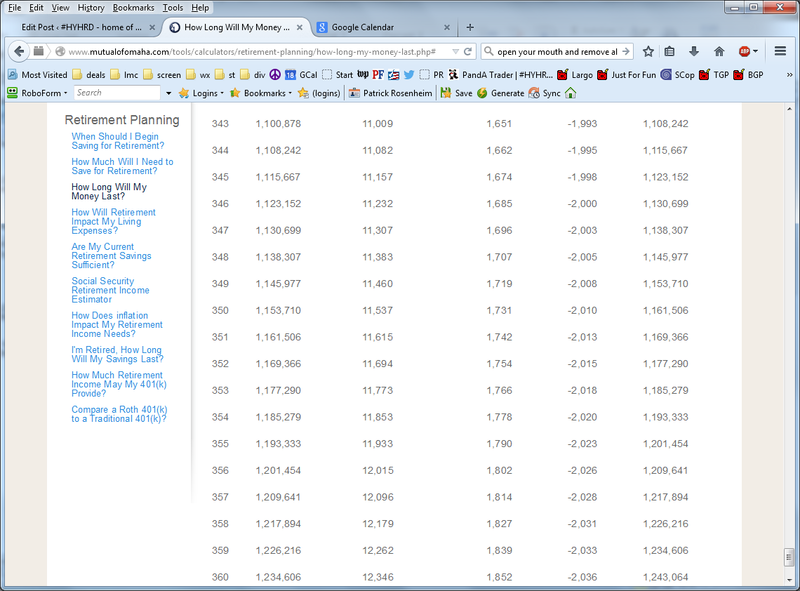 In my Roth-P account, I will withdraw $287.85 for a net deposit of $215.89 after 25% tax withholding. In my wife’s Roth-A account, I will withdraw $346.67 for a net deposit of $260.01 after 25% tax withholding. Any cash left in the accounts will be allowed to accrue for any upcoming stock purchases and/or withdrawals. 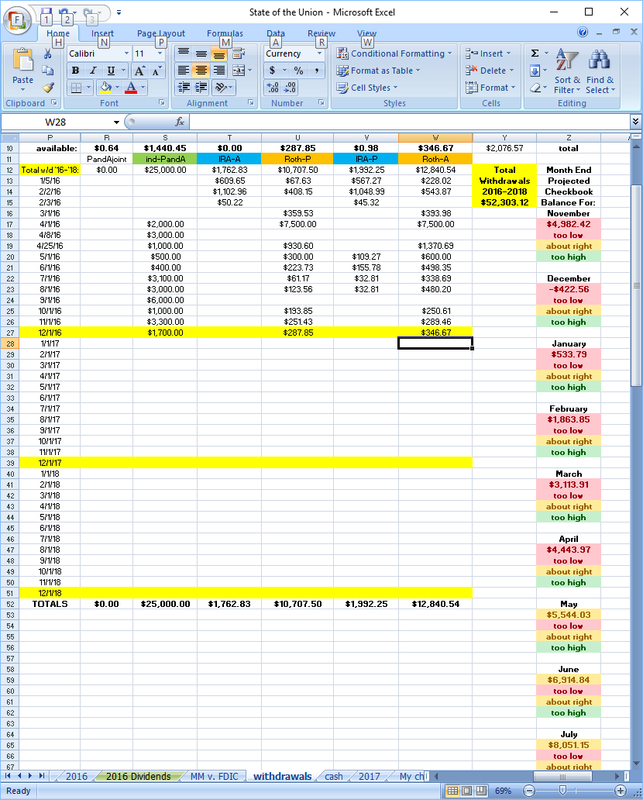 The cash balance of each account and the amount available to invest are shown on the Equal Weight spreadsheet. 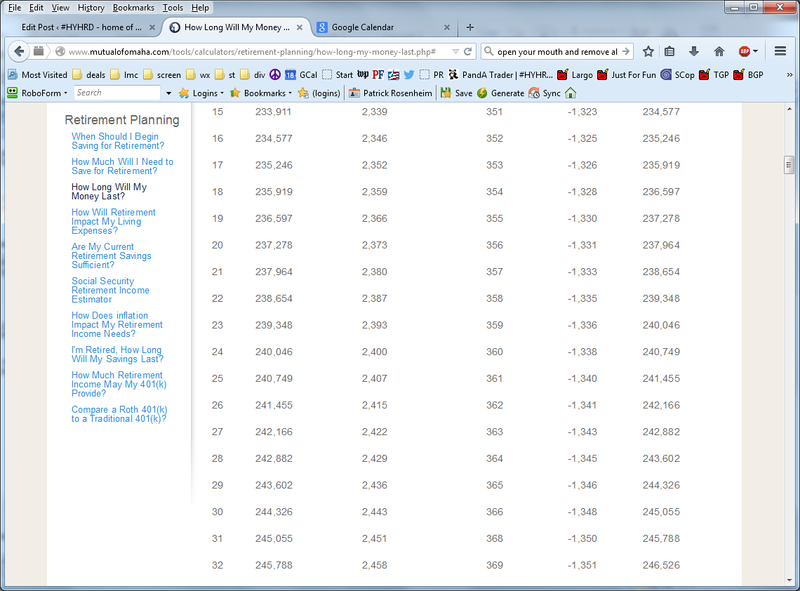 The withdrawal amounts are shown on the withdrawals spreadsheet. Withdrawals will only be taken as needed. This is subject to change as necessary. We might need to plan for my first RMD withdrawal in December of 2024, which should be totally covered by dividends for *at least* the first few years. If I convert 1/7 of my remaining IRA each year starting in January of 2017, then the balance at the end of the year before my RMDs are scheduled to start will be $0.00, eliminating the need for any RMDs! There will not be any RMDs for my wife’s IRA because I totally converted her holdings to her Roth IRA this year. Of course, we’ll still have our regular recurring monthly charges that will need to be paid, but the withdrawals from the Roth IRAs and individual brokerages should cover that, and we are already taxed on anything that we make in our individual brokerage accounts. UPDATE: January 1st, 2016 Partial conversions to our Roth IRAs have been initiated on 12/31/15 from our IRA accounts. CYS & ORC positions have been rolled over, and AGNC positions will be next, followed by NYMT and then AI. I also plan to convert my CNSL holdings to my Roth IRA this year, and I also plan to totally convert my wife’s holdings to her Roth IRA this year. I still have a few years to go before RMDs are required and will most likely convert 1/7 of the remaining holding(s) in my IRA each year starting in 2017. This, of course, will result in huge tax bills for last year and this year, and I will be wihholding 25% from each withdrawal beginning this year for upcoming tax bills. UPDATE: 6/1/16 I really need to re-do the following section, since our accounts have changed so much. Maybe next year I’ll get it done. UPDATE: 4/1/16 I really need to re-do the following section, since our accounts have lost so much equity. See below this whole section for the update. 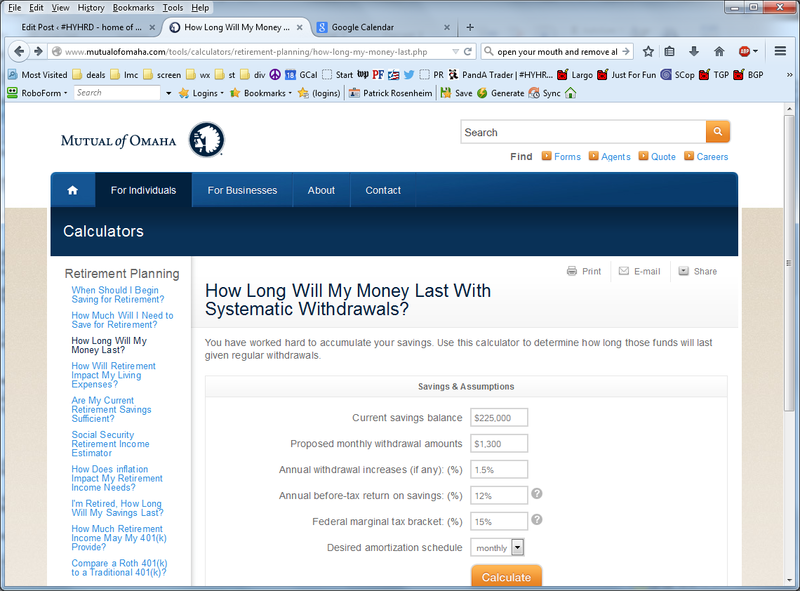 On 12/18/14, I performed a calculation of how long my money will last with systematic withdrawals on the Mutual of Omaha website. As you can see, our portfolio should more than quintuple in 30 years according to these results, even after withdrawals. I believe the rate of increase is actually under-estimated, and the portfolio should increase at a much higher rate. and the next series of withdrawals shows a slight increase in beginning balance, annual interest, taxes, withdrawal amounts, and ending balance. …and lots of withdrawals in between, from 33-342 months (not shown), which all show a slight increase in beginning balance, annual interest, taxes, withdrawal amounts, and ending balance. So, after 30 years (the maximum shown on the website) of these monthly withdrawals, $225,000 turns into more than 1.2 million dollars. What am I going to do with all that money when I’m 90? Well, there are a couple of things on my list; an Excalibur Cabriolet for one thing. Gifts to the kids is another. I hope I don’t start watching Televangelists or voting for the GOP (or the Democrats, or Libertarians)! On 3/1/16, I performed a calculation of how long my money will last with systematic withdrawals on the Mutual of Omaha website. As you can see, our portfolio should increase about 47% in 30 years according to these results, even after withdrawals. I believe the rate of increase is now more correctly estimated, and the portfolio should meet our basic “sunset years” needs, albeit minimally. …and lots of withdrawals in between, from 16-344 months (not shown), which all show a slight increase in beginning balance, annual interest, taxes, withdrawal amounts, and ending balance. So, after 30 years (the maximum shown on the website) of these monthly withdrawals, $170,000 turns into more than 250 thousand dollars. What am I going to do with all that money when I’m 90? Well, there are a couple of things on my list; an Excalibur Cabriolet a new pair of underwear for one thing. Gifts to the kids is another. I hope I don’t start watching Televangelists or voting for the GOP (or the Democrats, or Libertarians)! As you can see, my expectations have changed significantly these past couple of years. Realization that I am basically screwed financially from the outset is also starting to crystallize and I am making some changes, finally. This is truly depressing, but it’s all I have and I have to run with it.